Supports hair, skin & nails. What’s the HA Collagen Builder supplement? 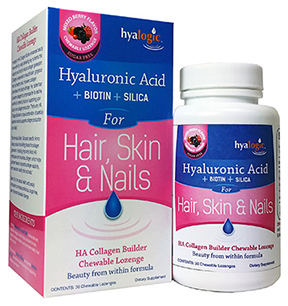 Hyalogic’s HA Collagen Builder enhances beauty from within by orally delivering key nutrients that support your body’s natural collagen generation. Collagen is essential for beautiful skin, gorgeous hair and healthy nails. However, collagen diminishes in the body with age. Yet, rather than consume collagen to compensate for its decline, we think it’s better to focus on supporting your body’s own collagen production. That’s why HA Collagen Builder’s unique combination of carefully selected nutrients supports collagen production and vitality. 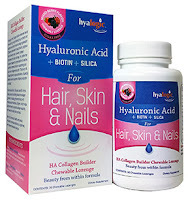 What are the ingredients in the HA Collagen Builder? Hydrating Hyaluronic Acid (HA) moisturizes and nourishes collagen, which helps plumpen the skin, supports collagen elasticity and promotes healthy hair, skin and nails. The formula’s Biotin and specific Amino Acids provide the building blocks for supporting collagen generation. Why did Hyalogic develop this product? The formula’s Biotin, Silica and specific Amino Acids provide the building blocks for collagen generation. Hydrating Hyaluronic Acid (HA) moisturizes and nourishes collagen, which helps plumpen the skin, supports collagen elasticity, and promotes healthy hair and nails. Best of all, this natural and beauty formulation comes as a delicious, sugar-free, berry-flavored chewable lozenge.